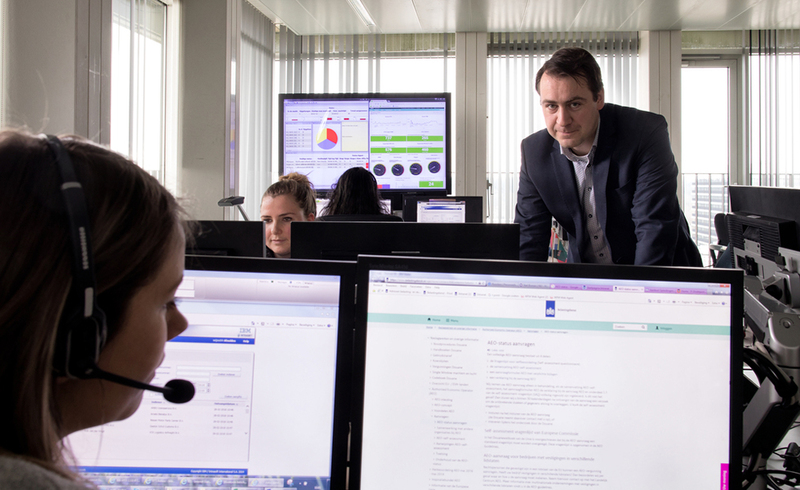 Per month, the NHD answers around 4,000 phone calls at phone number +31 88 156 66 55, and another 2,000 questions via nhd.apeldoorn@belastingdienst.nl. The average wait time for callers is 53 seconds. Most of the questions are about registering for and the functioning of customs systems, the automated processing of electronic messages and custom reports. The NHD can handle 85 to 90 percent itself; in other cases, they are generally dealing with a major malfunction. Questions about customs technology and general customs information – for example, commodity codes – may, legally, not be answered by the helpdesk. The Customs Information Line (+31 45 574 30 31) is the designated portal for this. The NHD is available 24 hours a day – even outside office hours (Monday through Friday from 7 a.m. to 5 p.m.). Those who call are told that, in case of a national malfunction or emergency situation, they can leave their number and will be called back within ten minutes.